Who's Fighting Who in Iran's Struggle? We're told that a young and restless Facebook generation has arisen in Iran, text-messaging and Twittering away at the fabric of a conservative clerical rule that it is no longer willing to accept. Ranged against it are the dogged defenders of a decrepit regime that has outlived its purpose, surviving only through brute force and its ability to convince the unsophisticated, mostly rural poor folk in their ragged suits and black chadors that President Mahmoud Ahmadinejad is their champion against corrupt politicians and the treacherous intellectuals and amoral rich kids who support them. Obviously these are stereotypes  and highly misleading ones at that. The schism in Iran is not reducible to social class, ethnicity, region or generation. A simple glance at the crowds over the past week reveals women in black chadors on both sides of the divide, and women in makeup too. Many kids whose parents were poor have themselves managed to get university degrees as a result of the revolution's largesse  Ahmadinejad may be a populist, and he may emphasize his humble origins, but he's proud of his Ph.D. (His supporters call him "the Doctor.") And many children of rural poverty who are now educated and living in the cities, though still of limited means, don't necessarily share the outlook of their parents. Absent a proper tabulation of the actual vote on June 12, we'll never know the exact distribution of political support to each candidate across the regions, social classes and age groups. But even in the rallies in support of the candidates before and after the election, it's plain that the country can't be neatly divided along the lines of those categories. Ahmadinejad clearly has a political base. He may have won votes from as many as 10 million people motivated by alienation from the political establishment and a belief that they have been cut out of the spoils of the Islamic revolution. The President has assiduously courted these constituencies by recklessly throwing money at them through unvetted infrastructure projects and social spending. Some government employees have doubled their income on Ahmadinejad's watch. And, of course, many Iranians are so resentful that they've enjoyed Ahmadinejad's naming and shaming of members of the political establishment he accuses of corruption. Many feel that most of the leaders of the Islamic Republic have betrayed the revolution that propelled them to power and made it harder for its foot soldiers to get ahead. 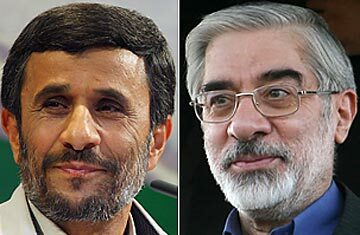 In opposition candidate Mir-Hossein Mousavi, Ahmadinejad's supporters see the epitome of the parasitic political class the President has railed against. But Mousavi's support ranges from the urban middle class, students and the intellectuals who previously brought the reform movement to power to many people of humble backgrounds, for whom Ahmadinejad's triumphalist economic claims simply don't ring true. They know the economy has gotten worse on his watch because they have been the most vulnerable to its downturn. Ahmadinejad may go on TV and cite statistics to prove that things are getting better, but they're the ones who are unable to marry because they can never afford to get their own homes. So there's no easy demographic breakdown between the two sides. See TIME's covers from the 1979 Islamic revolution. Read "The Iran Election: Twitter's Big Moment."